With its sublime food, rolling landscapes that bewitch the eye, pristine hill top villages and amazing wines it’s easy to wax lyrical about the Brunello di Montalcino region. For me the more fruit focused and elegant Brunello di Montalcinos from higher altitude really sang and the excellence of the fresh crunchy Rossos, with their teasing savoury touch, was a real eye opener. If one had to be critical perhaps a few of the Reserves seemed to try a little too hard for critic scores at the expense of drinking pleasure but then again this just reflects the exciting diversity of wine making approaches to be found in the region. A must for all wine lovers. The 2010 vintage of Brunello di Montalcino has generated unprecedented world wide excitement and large volumes of sales on release. The quality, with attendant critical fanfare, is obviously a major factor, perhaps also a market hungry for excellence after a run of lack lustre Bordeaux vintages. The BdMs are generally premium priced wines and classically demand patience in the cellar and the premeditation to open them hours or even a day in advance to open up. However since the 2007 vintage they have become much more approachable in their youth than they traditionally were. Rosso di Montalcinos are generally made for drinking from release although many winemakers produce more serious offerings that can happily age. The wines come in quite a range of styles dependent on the vineyard location and wine makers approach to the use of new oak, extraction of fruit and length of aging in barrel. So there is probably a BdM to please all tastes from elegant with vigorous fruit to powerful, malty leather bound tomes. S.J IGT Toscana 2013. A blend of mostly Sangiovese but with some merlot aged in French oak tonneaux. Slightly dusty nose, cherries, some notes of plumb. Nice freshness, soft tannin and a roundness but with a characteristic Sangiovese fresh cherry finish. Rosso di Montalcino Ginestreto 2013. 14%.The rosso is made as a glimpse of the brunello. A slightly spirit nose, lovely crunchy fresh cherries in the mouth with a good savoury layer. Great balance, soft tannins, high alcohol balanced by the acidity. Good to drink now. Brunello di Montalcino 2009. 14%. Fuligni have already sold out of the 2010 vintage but explained that 2009 was in this part of the region as good as the 10. Light intensity garnet colour. Cherries on the nose, spice, cinnamon, touch of caramel with a meaty undertone, then orange peel: complex. More of the same in the mouth, medium body great balance and length. 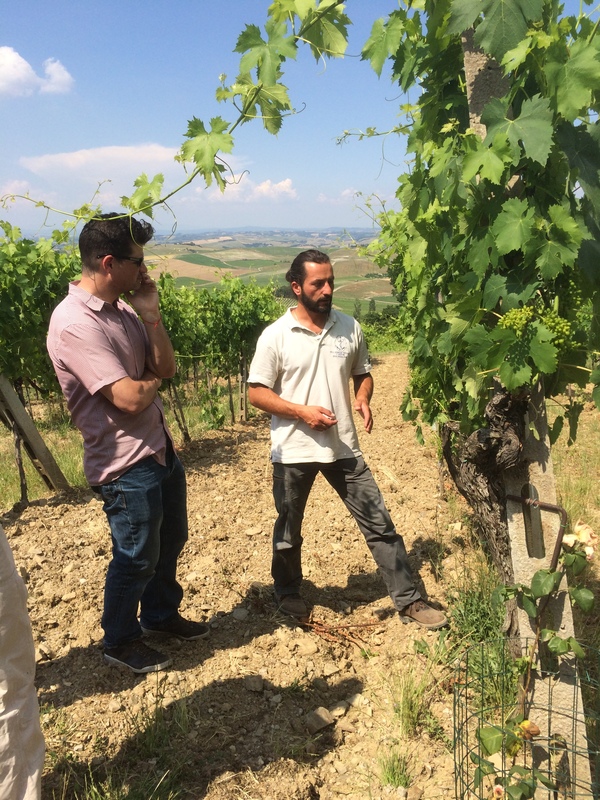 Siro Pacenti owns vineyards in the north of the region as well as the south. The wines are vinified separately and then blended to form both the Rosso and BdM. The wines are raised in French oak barrique except the riserva which is matured in larger tonneaux. BdM Pelagrilli 2010. Smokey nose, bit of balsamic, some spice, herbs, thyme, oregano and red fruit. In the mouth intense concentrated red fruit, cherry pie, smoke, toast but not overwhelming and well integrated. Some charcuterie and a lick of vanilla. If hoisin sauce was made with cherries this would be it. Very long. Excellent. BdM Vecchie Vigne. 2010. A tighter nose, earthy spices: cumin, turmeric, sour cherry, a bit closed but deep. Medium body, fresh with mouth coating firm but ripe fine grained tannins. Ripe fruit, blueberries but a bit masked by the wood influence, meat and blood below. Very long. 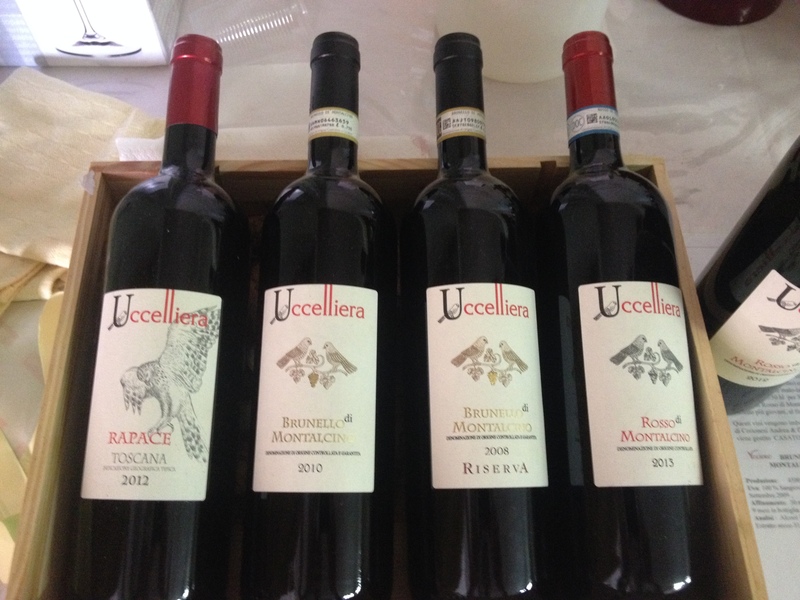 Uccelliera, named after the hunting bird loft that still stands on the site, produces a total of 60000 bottles from 6 hectares of Sangiovese plus half a hectare of merlot & cabernet sauvignon. Winemaker Andrea also has olive trees and animals on the farm. Some of the vineyards lie around the house and were purchased from neighbouring Ciacci Piccolomini but additional plots have been added in the Orcia valley along with a plot of older vines planted in 1975 north of town. 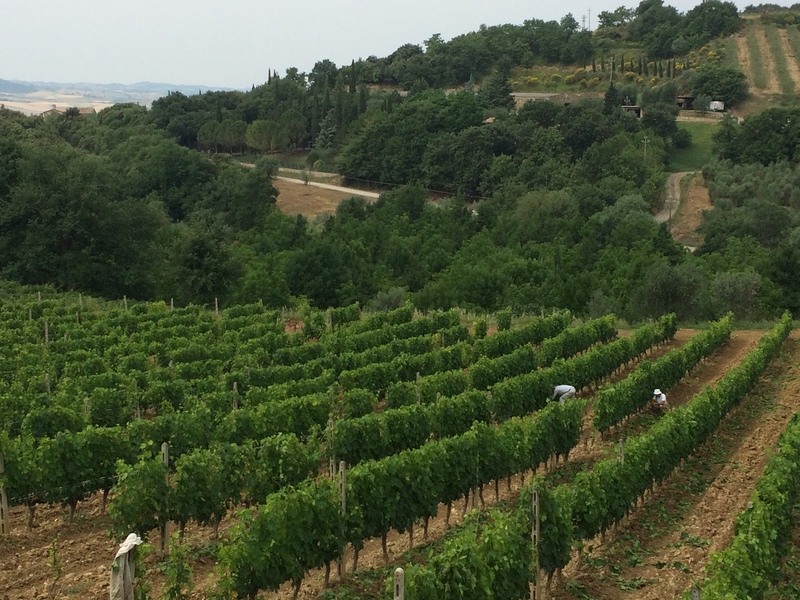 The vineyards are farmed organically and the dry conditions of the Orcia valley favour this. When necessary they spray calcium in the early mornings. The Rosso is already selected and vinified separately over several picks. The grapes are covered in dry ice to avoid oxidation as soon as they are picked. They are then cold soaked to block fermentation for the first few days to extract colour and allow the natural yeasts to develop and eventually start fermentation. The Brunello spends about 1 month on skins and the Rosso 20 days. The winery also uses very old French oak barrels which are not toasted for magnums. These were originally destined for the Riserva as the very tight grain produces elegant Sangiovese. An IGT in magnum is now produced which is not to be confused with the regular Brunellos which are aged in large Slavonian oak barrels and around 20% new French oak barriques. 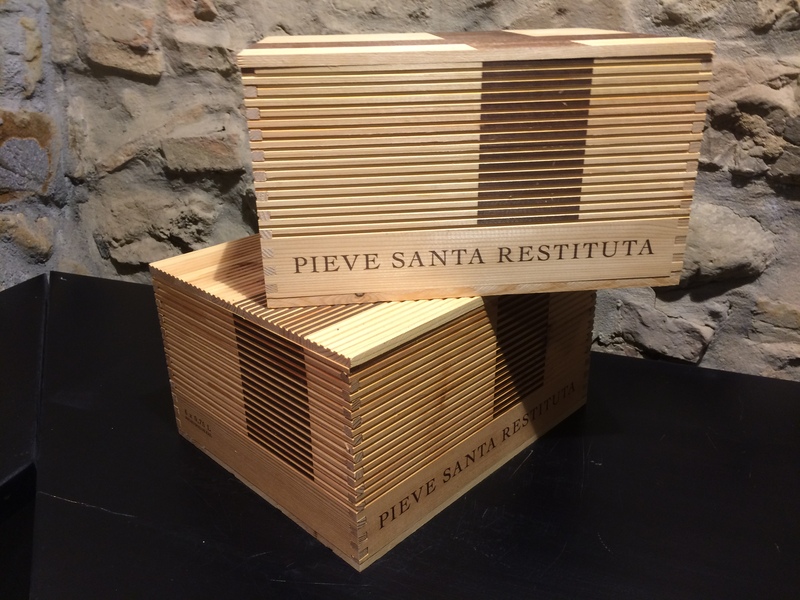 The Riserva is produced from specific vineyards with the oldest vines and highest altitude. 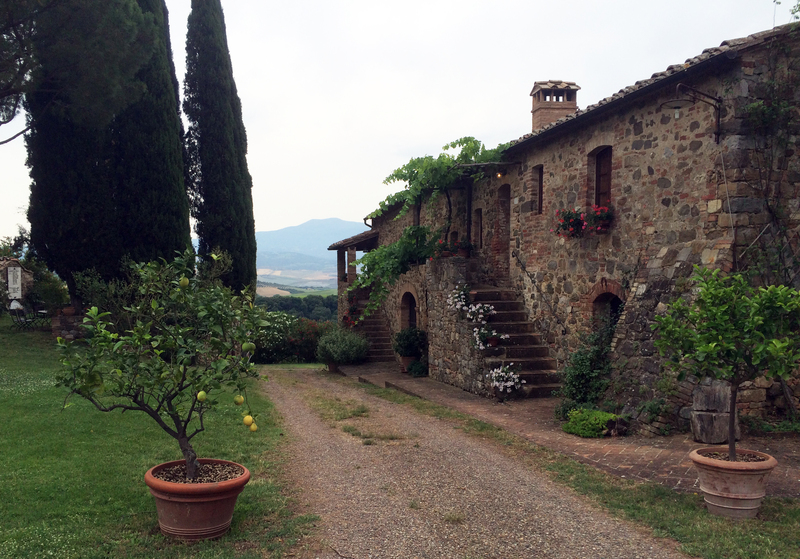 The climate is very localised with up to 5 degrees difference with Montalcino and a different profile of rainfall. The geology and soils are also very varied across Montalcino from area to area. BdM 2014 from large Slavonian oak barrels and lower elevation vineyards. Up front fruit, darker cherry, fine grained tannin, high acidity. This has only been in barrel for about 6 months out of the two years it is destined to spend. BdM 2014 from lightly toasted French oak barrels from higher elevation vineyards. Slightly richer riper fruit a hint of toast, fine grained tannin more grippy very long. Of course very primary at this stage. The wines are matured in barrel separately then blended later and finished in either type of barrel according to the development of the wine. Andrea is beginning to leave longer and longer intervals between racking the wines off the sediments sometimes up to 2 years. BdM 2013 from large barrels 1.5 years in. Slightly reduced, funky nose at first then clears to give red fruits lightly confected. Lighter body & more floral with slightly grainer tannin grippy & a touch fierce at the moment. BdM 2013 smaller barrel, upper level vineyards. More red fruits and more concentration, fresh cranberry, less oak influence than the equivalent 2014, just a touch of pastry, lovely freshness. Good length. Rapace Toscana 2013 barrel sample. This IGT is a blend of Sangiovese 60%, merlot 30 % and cabernet 10%. The grapes are co-fermented in small French oak barriques. Darker more intense colour. More dark fruit, rich toasty notes, fuller body with medium acidity. Spice, cinnamon, coffee etc. but still good pure fruit. Long finish. Rapace Toscana 2012 in bottle. Again darker, medium body, ripe fruits, rich with spice and lots of tannin and toast. Great length. Brunello di Montalcino 2012 from large barrel. Red fruit a bit of herb & spice red fruit, savoury notes of blood. Lots of mouth coating friendly cocoa like tannin, very long. BdM 2012 from barrique. Sour cherry, sweet toast with a bit of roast coffee. Really powerful with lots of grippy oak tannin high alcohol. BdM 2012 in barrel blend 50: 50 of the above: More of the fruit and savoury character but with the volume turned up on the tannin and oak compared to the large barrel sample. Fascinating to see how the blend melds to best of both, keeping the fruit but adding structure from the wood. Not the final blend but this looks like it will be a fantastic Brunello! Riserva BdM 2012 from the 1975 vineyards barrel sample. More concentrated fruit, savoury with a mineral iron note, complex, graceful and yet powerful very long and delicious. Another one that promises to be superb. BdM 2011 final blend. Lighter body & more elegant with lovely balance of fruit and touch of umami. Great freshness and good length. A really nice drinking wine that won’t need years of patience. Too lightly described as a restaurant wine in my opinion. BdM 2010 out of bottle. Slightly spirity nose, touch of cola bit tight & concentrated but persistent deep. On the palate a fantastic combination of ripe fruit & savoury, mineral notes. Great freshness and lovely balance and very very long finish. Really complex. The combination of elegance and power is obviously why there is such excitement about this vintage. BdM Riserva 2008. More savoury vegetal nose with sour cherry dried herbs and balsamic notes. Lovely rich moth feel, more baked fruit, beginnings of tertiary flavours. The extra time breathing in wood barrels softens the wine and develops more mellow flavours. Complex and very long. This was an incredible tasting which gave us a great insight into the craft and skill that goes into making the outstanding wines, a real labour of love. The wines were superb and are available at Justerini & Brookes. The 2010 BdM has just been released and is an outstanding wine for a great price. The 2012 Rosso is also a superb value delicious drinking wine. The whole production of Col d’Orcia has been certified organic since 2013 and at 540 hectares is the largest organic producer in Tuscany. Col d’Orcia is third largest Brunello producer making 800,000 bottles per annum of which 20, 000 are the renowned single vineyard BdM Poggio al Vento, the ‘windy ridge’. 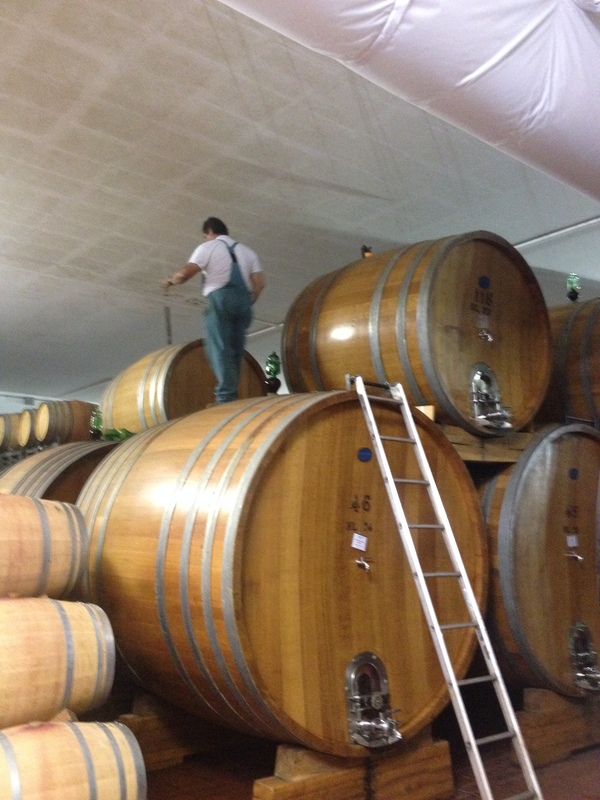 The wines are aged in large Slavonian and French oak barrels to allow the wine to breathe and develop over time. Banditella 2010 Rosso di Montalcino. This is a single vineyard wine matured in 20 to 25 % barrique with a production of 25000 bottles. Lovely cherry notes on the nose. Medium body on palate with great freshness, crunchy cherries and some savoury notes. Nice grainy tannins, a bit grippy but good fruit length on the finish. This is a great food wine with tomato based pasta dishes. Brunello di Montalcino 2010. Aged 36 months in large oak barrels, 60% Slavonian and the rest oak tonneau with no barrique. Tasty sour cherry notes with some wild garrigue herbs, floral notes of iris & hyacinth. Medium body, fine bright red fruit, great freshness savoury hints with a residue of caramel. Fine grained tannin, nicely grippy and long. Works beautifully with local Pici ragu!. Poggio al Vento BdM 2007. Single vineyard from a fantastic year. Red fruit, some leather and tobacco leaves, garrigue herbs complex intense nose even though it is still a bit tight. Medium body with good crunchy red fruit and very fine grained tannins, sustained savoury notes, still rather reticent but with really lots of length. This is a great wine needs time to open up either in the glass or after a few more years. BdM 2014. Barrel sample. Nice cherry fresh fruit, med body, toasty but subtle, great freshness. Will be a good one. 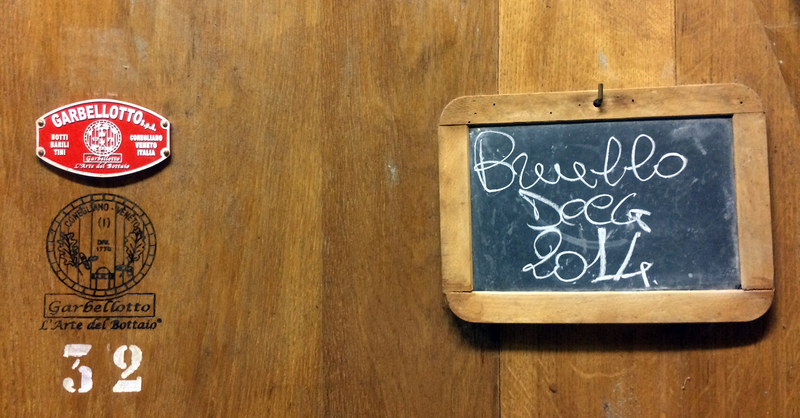 BdM 2012.Barrel sample. Attractive kirsh cherry, backed tart, spices, creamy toast, bit of tobacco lots going on already. Great balance and freshness. Excellent this bodes well for release next year. Perched on a hill top just north of Sant Angelo in Colle Castello di Argiano is a tranquil oasis heavy with the scent of blossom and surrounded by beautiful views across the surrounding rolling countryside. 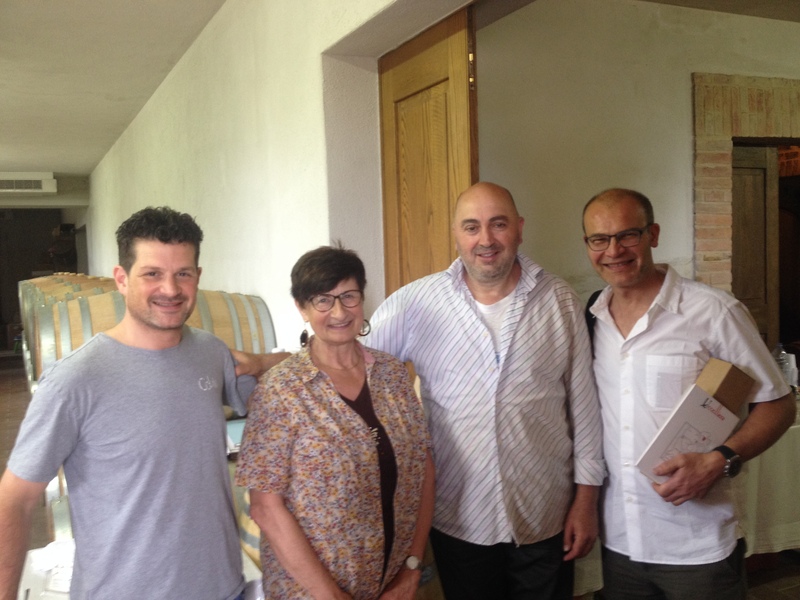 No wonder Guisseppe & Elisa Sesti fell in love with the place long before they started making the estates wines. Sauvignon Blanc 2014. Made just for the family. Floral; orange blossom, citrus, nice mineral stoney sensations balance the fruit, high acidity. Beautifully balanced. Lovely to taste a white, superb! Rosato 2014. A really pale rose pink colour. Made with 100% Sangiovese. Minerals on the nose, some dried herbs. Bracing saline feel in mouth, high alcohol, light fruit, lingering red fruit after taste. A perfect sun downer. Monteleccio 2013. This is an IGT as it is aged less than the regulation one year in barrel to make a Rosso di Montalcino. Strawberry confected fruit, some herbyness, and cumin too on the nose. Wow this is great! Lovely fresh crunchy wild strawberries, minerality gives it some substance, lovely length & balance. A delicious wine to simply enjoy equivalent of many Rossos. Fantastic value. Brunello di Montalcino 2009. This flight of wines are a progression with a clear common character running through them all, the intensity just successively steps up but each is perfectly balanced in itself. The BdM has more fruit, more cumin & turmeric, more violets & wild garrigue herbs then introduces some tobacco leaf, blood and meat. Then perhaps a whiff of new Gucci leather hand bag. Complex to say the least. Medium body, silky tannins which are reasonably grippy, rich sour cherry fruit. The palate is not as open as the nose but there are beginnings of some secondary flavours too. Lovely mouth-watering acidity with a very long finish. This is my kind of wine! Phenomina BdM Riserva 2005. Each vintage has its own astronomical themed label, this one showing Venus joining Jupiter. Darker brown hues with medium intensity colour. Malty notes, cola, sweeter baked fruits, then tobacco, crème caramel, orange peel, lilies. Medium body, baked stewed fruit, plumbs, rhubarb, leather, high acid, soft tannins great balance. Tobacco notes with a long savoury salty finish. Amazing complexity! The winery is named after the church on the site which is now converted into a stunning seminar & tasting room. Vaulted tunnels lead down to a state of the art winery hidden under the entrance driveway. The only clue to this subterranean structure is an oxidised steel sculpture by the architect floating over its central roof light. Wine making in the area dates back to Roman times and the vineyards have long been prized and even fought over by competing nobles. 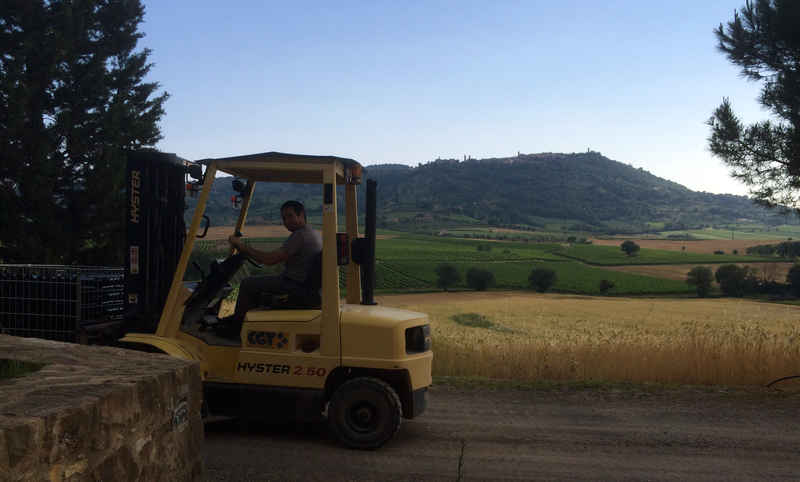 The winery has 25 ha in total, 17 surrounding the winery and 8 near Torrenieri. The Rennina vineyard adjoins the winery and the vines are immaculately groomed in traditional Guyot style. Sugarille vineyard lies just to the south. Fermentation is temp controlled and micro oxygenation used. The wines are aged in oak tonneau for 24 months with 20-25% new oak. Then it spends 6 months in concrete tanks before bottling which helps remove the sediment. Interestingly Gaja rates 2011 and 13 over 2012 because high temperatures accelerated sugar ripening, and therefore alcohol, over phenolic ripeness. It’s therefore probably unlikely that Sugarille will be made. Many other wine makers on our trip extolled the virtues of the 2012 vintage. Brunello di Montalcino 2011. Ripe red fruit, a balsamic strand, sweet sandalwood & floral notes. Great balance, high acidity, mouth coating tannin, quite grippy, high alcohol with a slightly hot finish. But long with nice baked fruit flavours. Already a very tasty wine. Rennina BdM 2011. Single vineyard. Slightly spicy, herby nose, bit of meat and blood, complex. Lovely mouth feel with fine grained tannin, bright acidity and crunchy cherry fruit. Tasty savoury and mineral notes again a little residual wood tannin that needs to integrate. Already drinking well but built to last. Really delicious! Sugarille BdM 2011. Sugarille vineyard is mostly galestro soil schist where Sangiovese excels. Slightly spirity on the nose, strawberry, confected red cherry fruit, bit tight but some dried herbs. Quite powerful, rich concentrated fruit, fine grainy tannin with grip, long fruit finish. Again bit of wood on the finish. Quite a powerful wine but with great balance and persistence. Sugarille BdM 2014 barrel sample. Cherry boiled sweets, bit of ground coffee on the nose. Wow lots of toast and lots of tannin, medium body, moderate acidity really good length. Obviously still pretty embryonic having only spent a few months in barrel. Sugarille BdM 2013 barrel sample. Some high red fruit notes but lots of coco and coffee grounds on the nose. Medium body, nice ripe cherry paste flavours, some toast & more coffee grounds, lots of tannin and bright acidity, all tightly packed. Oak tannin on the finish but very long flavour profile. The makings of an awesome wine. Fascinating to taste the Sugarille single vineyard Brunellos as they evolve in barrel. These are uncompromisingly serious wines, packed full with everything meticulously in place and with extraordinary potential. 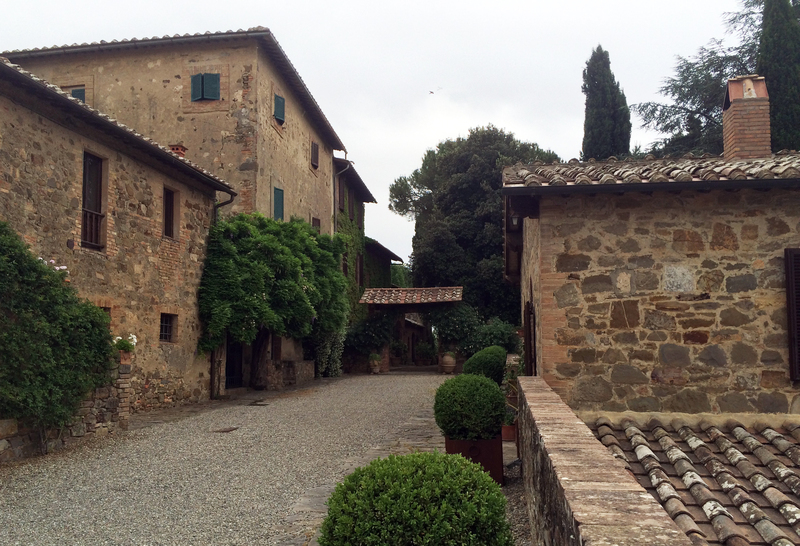 Located just outside the town of Montalcino Costanti is one of the oldest wineries in the region. 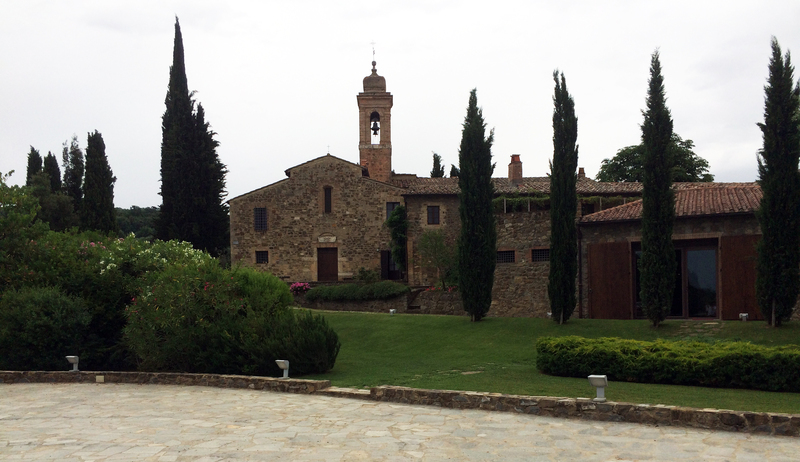 The vineyards are immediately around the house and adjoin the famous Biondi Santi winery. 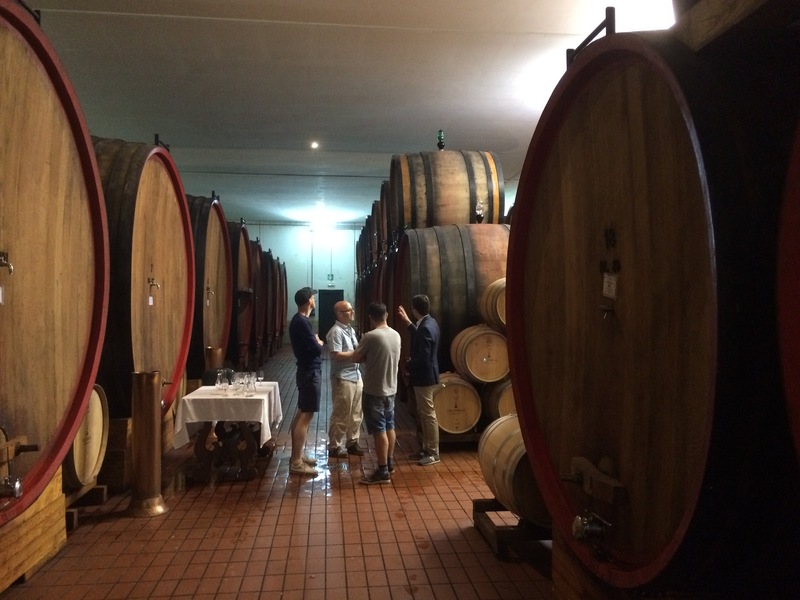 Annual production is generally 50,000 bottles overall with 35,000 bottles of BdM around 8000 bottles of the Riserva. 2013 Rosso di Montalcino 14.5% Aged 1 year in oak tonneau then 12mths in bottles. The oak is 50% young but not new having been used for the family’s table wine for a couple of years. Sweet cherry strawberries, floral notes, really fresh with beautiful balance. Sweet fruit and savoury notes, overall delicate with soft, cool tannins and a very long persistent finish. A Baby BdM m really excellent! 2010 Brunello di Montalcino. 14% Clear bright ruby colour. Grandma’s homemade strawberry jam, perhaps some herbs, thyme. In the mouth ripe cherry, some orange citrus notes, nice structure underneath. Crisp acidity and beautifully integrated tannins. Amazingly approachable now but with great precision and structure for a long life. A fantastic wine with a very long lingering herb and mineral finish. 2007 Riserva BdM 14%. Slightly darker colour but clear light intensity. Ripe dark cherry sweet fruit with a touch of smoke and dried herbs. The beginnings of secondary notes: Gucci band bag & a whiff of menthol. More rich ripe sweet red & black fruits on the palate with lovely savoury notes. A medium body wine with silty tannins with a bit of grip. Enough freshness and again very long finish. Superb balance. This is a bigger wine but not for the sake of it. Outstandingly good. 2012 Ardingo. 100% merlot from Monosoli vineyard aged in French oak barrique. Nose of plum chutney with a bit of smoke. Another amazingly elegant wine, an overall impression of baked red fruit pie with custard. Great freshness to balance the secondary toast and creaminess. Ripe tannins and good length. One of my top tastings where the consistent elegance and freshness of the wines really appealed. Categories: Everything else, Italy, tasting notes | Tags: Brunello di Montalcino, Col D'Orcia, Conti Costanti, Gaja, Italy, Rosso di Montalcino, Sangiovese, Sesti, Tuscani, Ucceliera | Permalink. 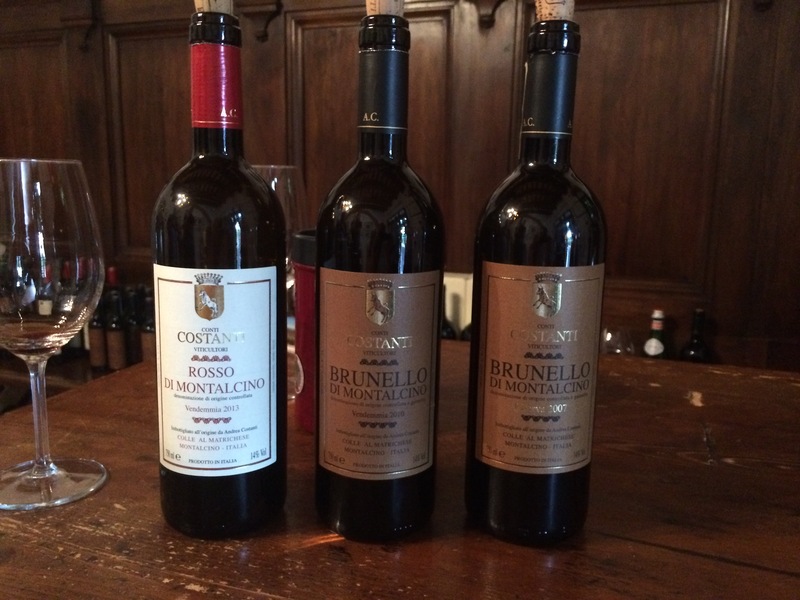 What a wonderfully extensive post on Brunello wines! 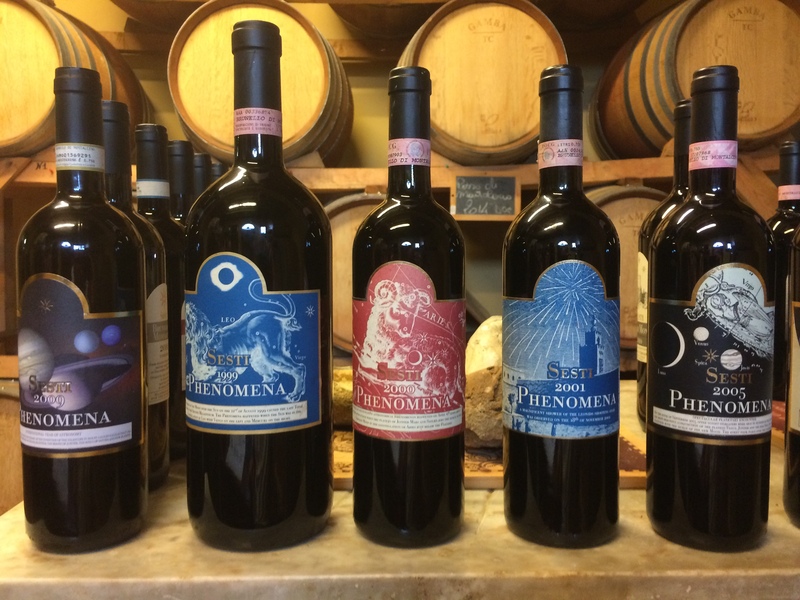 The first time I really appreciated a red wine was when I tasted a Brunello in a tiny vineyard near Siena and since then its been my favourite so this post is fascinating, thanks for sharing!